Spread the word please. Brown bag lunch with Rebecca Vilkomerson of the Jewish Voice for Peace at TESC, Sem 2, Room 1107 from noon to about 2 pm on Wednesday, December 11th. Want to think about peace in the holy lands? Wonder where the holy lands are? Look at your feet. Look to your heart. Seek the peace in your soul. “The first peace, which is the most important, is that which comes within the souls of people when they realize their relationship, their oneness, with the universe and all its powers, and when they realize that at the center of the universe dwells Wakan-Taka (the Great Spirit), and that this center is really everywhere, it is within each of us. come join us and pass the peace, share the peace, bring the peace that is within the souls of all of us. One night Trayvon Martin walked to the store. On the way back he was followed and harassed by racist vigilante George Zimmerman. The vigilante murdered him. The police showed up, but they knew Zimmerman. His father was a judge. They took him to the station, questioned and let him go. Zimmerman became a hero for right wing, white supremacist forces. He told Sean Hannity it was God’s plan that he killed Trayvon and that he had no regrets. Only nation-wide protests forced the state’s hand to bring charges weeks later. The facts of the case are well-known enough. No need to repeat them. Over a year later Trayvon Martin was put on trial in front of a nearly all-white jury. Rachel Jeantel was put on trial. Black people were put on trial. A typical teenager, Trayvon was turned into his opposite: a black male preying on white America. No one should be surprised about the verdict, though liberals and progressive seem to be. The civil rights establishment is at a loss for words. They have nothing to say after no better an example of the fact that the law is not for black people, the oppressed, or the working class. How could Trayvon, a typical teenager, and Zimmerman, a spiteful predator, be turned into opposites? Thanks to Austin for the reference information. Members of our beloved community are detained in Federal detention and are being held in solitary confinement for refusing to cooperate with a secret grand jury. Charges against these individuals? None. Indictments against these individuals? None. Convictions against these indivicuals? None. In a beautiful world beset by disturbing and dangerous trends this is a particular disturbing business. Free Kteeo. Please. Free Kteeo. Please. Friends are in jail. We don’t know how long they will be there. We don’t what criminal activity is being investigated that leads to these folks being jailed for refusing to answer Grand Jury questions. Jump in, you can help. We are the ones we have been waiting for. 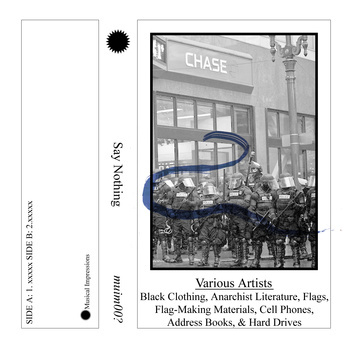 M usical Impressions has created a compilation album called “Black Clothing, Anarchist Literature, Flags, Flag-Making Materials, Cell Phones, Address Books, & Hard Drives” in support of the Grand Jury Resisters. You can buy it here. Proceeds go to support the legal and material needs of those resisting the FBI investigations of anarchists in the Pacific Northwest. The ability to labor resides only in a human being, whose life is consumed in the process of producing. First it must be nine months in the womb; must be fed, clothed, and trained; then when it works its bed must be made; its floor is swept, its lunchbox prepared; its sexuality not gratified but quietened; its dinner ready when it gets home, even if this is eight in the morning from the night shift. This is how labor power is produced and reproduced when it is daily consumed in the factory or office. 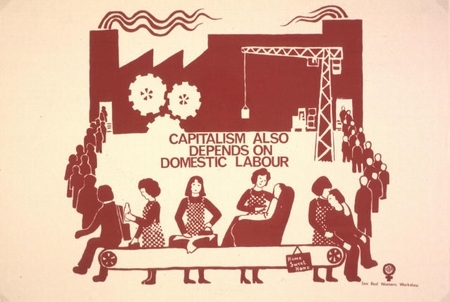 To describe its basic production and reproduction is to describe women’s Work. 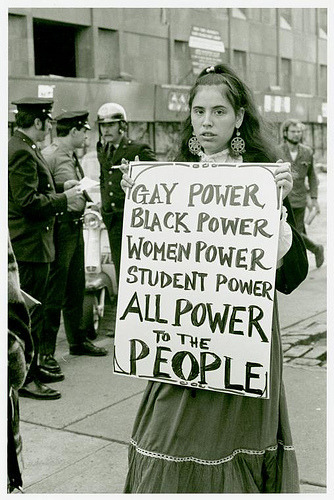 I have been thinking about dual power, working for the political change that I want as one means of seizing power and living the daily politics of the world that I dream about as the second means of demonstrating the power of a different political vision. Austin sent along a posting from Katie Loncke from March 2011 that is thinking on similar lines. I like the term that Kloncke uses, pre-figurative politics, to identify the immediate implementation of a political system. Here is the piece from Kloncke. If you want to know more about her ideas, jump to her website. “Katherine Olejnik, a 23-year-old recent Evergreen College graduate living in Olympia, was among those jailed. Her father said his daughter has been an activist in social-justice causes since her youth. She is not suspected in the courthouse vandalism, court papers say. She was called in to testify Sept. 27 about someone she knows, according to her lawyer. Even after Olejnik was given full immunity from prosecution by the judge, she declined to testify. U.S. District Court Judge Richard A. Jones said he had no choice but to send her to jail for up to 18 months, or until she changes her mind. “What (prosecutors) decided to do is choose people and punish them for their association,” said her attorney, Jenn Kaplan. Matthew Duran, a roommate of Olejnik’s who works in computer security, was jailed for civil contempt Sept. 13 after he, too, refused to testify before the grand jury. A longtime social-justice activist, he describes himself as an anarchist, according to his attorney, Kim Gordon. He is not suspected in the courthouse vandalism. Read the article in the Seattle Times? This evening = 6-9pm Michael Parenti event (Lecture Hall 1). Several TESC programs and the Olympia Movement for Justice and Peace (OMJP) are pleased to announce that this important event that will be held at The Evergreen State College on Friday, October 19th and Saturday, October 20th. 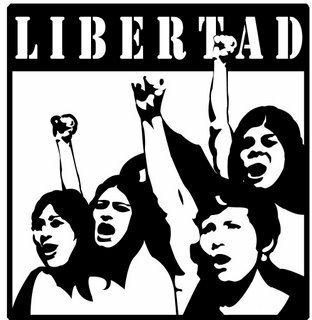 The Peoples’ Movement Assembly will bring together activists and scholars from the region to discuss not only what are some of the major social, economic, and human rights issues that we face, but also what can be done about them and what some people are actually doing now. 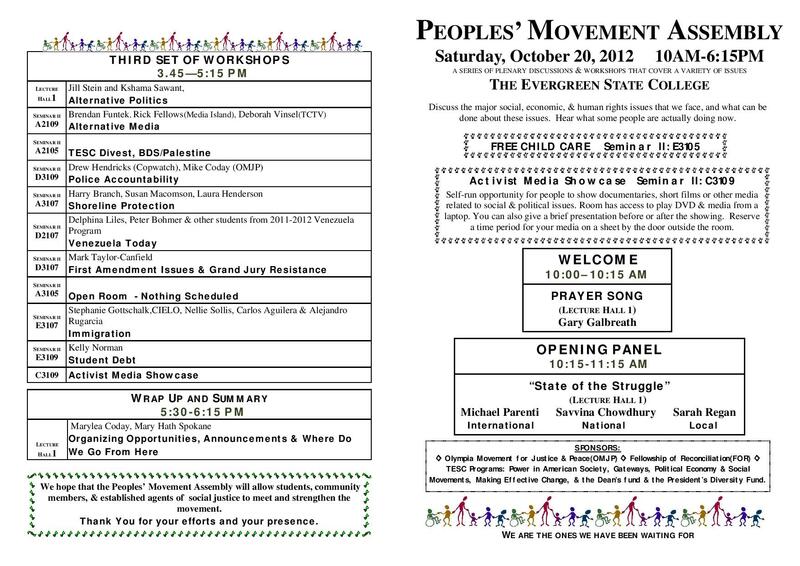 This event is FREE and open to the public, especially the Evergreen community and the larger Olympia community. For more information on Dr. Parenti see his website at http://www.michaelparenti.org/. 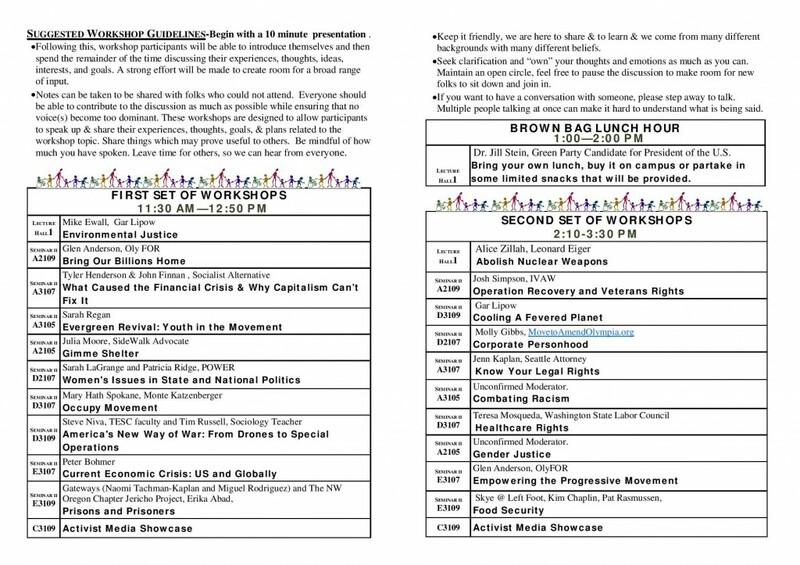 On Saturday, October 20, from 10AM-6PM, there will be a series of plenary discussions and many workshops that will cover a variety of issues such as the environment, prisoners, the economic crisis, Bringing our Billions Home, food security, the occupy movement, organizing, nuclear weapons, movement building, veterans, new methods of war, gender issues, healthcare, corporate personhood, Palestine, alternative media, Venezuela today, police accountability, and many other workshops. A more detailed schedule is below. On Saturday we will begin with an opening panel at 10AM on local, national, and international issues. There will be three sets of workshops of about 90 minutes each that will begin at 11:30, 2PM, and 3:45 PM, and a closing plenary at 5:30 PM. All are invited for all or any part of the program. A more detailed program is below and a printed program will be available on the day of the event at Lecture Hall 1 and the Seminar 2 building. Please tell all of those in the Evergreen community, especially students and also those in the greater community. TESC programs that are helping to sponsor this event are Power in American Society, Gateways, Political Economy and Social Movements, Making Effective Change, and the Dean’s fund and the President’s Diversity Fund. Community Groups who have help greatly are the Olympia Movement for Justice and Peace and the Fellowship of Reconciliation. For more information contact mosqueda@evergreen.edu or 360-867-6513. N.B. The final schedule will be available at the FREE conference. Please send this announcement to others especially any lists that you belong to and to Facebook pages and other social media. “Edward Said is the late world famous Palestinian intellectual and literature critic. He was a prominent member of the Palestinian parliament-in-exile for 14 years until he quietly stepped down in 1991. In 1948, Said and his family were dispossessed from Palestine and settled in Cairo. He came to the United States to attend college and lived in New York for many years. Because of his advocacy for Palestinian self-determination and his membership in the Palestine National Council, Said was not allowed to visit Palestine until several years ago and passed away in 2003. This page took 0.185 seconds of computer labor to produce.